Editor’s Note: Inspector Peter Hawley reminds us how important safety concerns are. 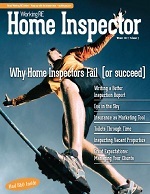 A few years ago, in my hometown, I was surprised to learn that a home inspector friend of mine had died. It was shocking and surprising because he was a fairly young man and still in good health. When I asked what he passed away from, I was expecting an answer like a car accident or an unexpected and sudden health issue, imagine my amazement when I was told he died on the job as a home inspector because of a failure to maintain routine safety measures. This particular incident motivated me to be more careful and to examine the practices and routines that I had settled into so comfortably. I learned that one of the reasons my friend died was very preventable. He had gone to a vacant home to do an inspection where the agent and client were not present. For most of us, this is an ideal situation but he forgot one simple rule: nobody knew where he was. Nobody knew what time he was going to be there. Nobody knew what time he was expected to be finished. Because no one knew where he was, when he injured himself, and I say injured, not killed himself, nobody was there to help. My friend slipped and fell through a garage ceiling while inspecting the attic and crashed onto the concrete garage floor. During the fall he struck his head and fell unconscious. He was still very much alive and probably would have survived if he had gotten help quickly. Unfortunately, no help was coming because no one knew he was injured. He lay on the floor of the garage for an estimated four to five hours until somebody finally came looking for him and discovered his lifeless body on the floor of the garage. This brings me to my most important safety point; always make sure somebody knows where you are and what time you will return. Better yet, have someone with you whenever possible. This can be your agent or client, the seller or simply your spouse waiting in the car for you. Make sure you answer your phone when being checked on. This is just one example of how a simple safety measure can save your life. I know some people think that this is taking safety to an extreme but a death like this makes you realize that what is considered a mostly safe job can pose serious risks, and that to stay safe, certain procedures must be observed. We are always in an unfamiliar environment and sometimes that environment is hostile, particularly when the sellers learns you are not there for their benefit or if we are forced to enter a place where our safety is in question. I live and work in a state that provides licensing and guidelines for home inspectors (Nevada). This is a wonderful thing even though I cringe each time I have to renew my license. The guidelines very clearly state what is considered dangerous and that we are not required to put ourselves into dangerous situations. In addition to these guidelines, however, the state includes into the licensing codes the concept that the final decision as to whether something is dangerous or not is up to the inspector. This statement allows discretion by the inspector on site based on each individual situation. This concept is in the NAHI, ASHI and NACHI Standards of Practice and that of other organizations. I encourage all inspectors to keep this idea in the back of their minds when considering a potentially dangerous situation. The basic rule for safety is: Never place yourself in any situation that will compromise your ability to continue working at the same level you are currently. As home inspectors we are constantly on ladders: Do you inspect your ladder on a regular basis? Most of us make sure the ladder functions correctly when we buy it but how many of us check to make sure all the parts are still where they need to be and working correctly? How many of us make sure the ladder is rated for what we do and is considered stable? When you are climbing the ladder, do you make sure it is on solid ground and angled properly to support your weight without slipping? We are also inside electrical boxes with current that could easily kill or severely disable us. We must recognize the fact that many homeowners think they are electricians and modify the main electrical panel and wiring with alarming regularity. Most of the time, these modifications are far from proper; add another unknown that we are forced to deal with. A simple check for electricity in the metal casing will prevent a shocking surprise. This check should be done on any metal disconnect or panel before you touch it. Another idea may be as simple as the screwdriver you use: Is it rated for electrical work? Yes, they are more expensive but I promise you they are well worth it. How about gloves? We are all in such a hurry to finish that many of us don’t want the hassle of gloves. And every one of us has opened an electrical box while standing in a puddle of water from the previous night’s rain or sprinklers that just shut off. Having come from a family of electricians, I have seen many minor jobs have major consequences. There will always be a small element of the unknown in what we do and where we are expected to go and inspect. We climb over, move through, check behind and look under many things we take for granted. In our own home, we know what to expect but we are not in our own home and we do not have the comfort of knowing what is in that dark, dank space. Remember the last time you opened a cabinet door and a rat/mouse/spider surprised you and you jumped back to avoid it? Gloves would have provided at least a small amount of protection if you had been attacked by that critter. In addition, if you had simply positioned yourself to be able to move quickly if necessary, by taking notice of any objects in your immediate vicinity, you could avoid the possibility of injuring yourself by striking something in the room if you are forced to move suddenly. I know little critters are a favorite of all of us who have to enter crawlspaces (not). I always save that task for last because I really don’t enjoy it and of all the places in a home, I think the crawlspace has the most potential for injury. There are so many situations that can occur in a crawlspace that you can be sure I am not going to be able to address them all. My favorite crawlspace story deals with my own unpreparedness. I entered a crawlspace and was at the far end from the opening when the battery in my flashlight died. I did not have a backup and had to crawl in pitch black darkness to the area where I thought the opening was. I was under that house for over an hour trying to get out. You can bet that now I carry a second light source at all times. In addition to the second light, proper attire is also essential: long-sleeved shirt, long pants, boots and even some sort of head protection. This can be accomplished by purchasing jumpsuits for use during the crawlspace inspection. Now we can address the other end of the home, the attic. Most of the same things that apply to a crawlspace apply to an attic. And yes even some sort of head protection should be worn: remember all the nails that construction crews put in but do not remove when they miss the truss member when installing roofing material? How about the roof? How casual have you become because it is “just another roof”? I guess I should consider myself lucky because I have a fear of heights and therefore am very careful on all roofs. Again, we are in unfamiliar territory, this area is exposed to all the elements of weather and rarely checked on. Walk softly and carefully, be aware where the truss or framing members are and place most of your weight directly on the framing member. If the roof is soft, proceed very carefully and don’t walk where you feel it may not be able to support twice your full weight. Other considerations should be observed also. What is the pitch of the roof and is it safe for you to be on it? What is the weather? Is that aspect going to change the conditions enough to prevent me from doing my job safely? Can I obtain the same results from doing my inspections though binoculars or second story windows and other vantage points at the roof’s edge? If you get the same results, why endanger yourself and your livelihood? One of my favorites is when I enter a home and the first thing I’m asked is to remove my shoes. I always politely decline informing them it is against company policy. I am sure you are asking why decline such an innocent and harmless request, since many of us do this in our own homes. Again, I must remind you that you are in unfamiliar territory. You do not know the condition of the floor or any objects you will be standing on. One inspector in my company stepped on a nail that was protruding from a floorboard and spent the rest of the day in a hospital emergency room going through the very unpleasant task of getting a tetanus shot. This is the reason it is now against company policy to remove shoes. Always carry booties as a regular part of your toolbox. You stay safe and your client is not upset at your wearing dirty shoes in the home. This is the very definition of a “win/win” situation and good customer service. My last major area is the garage. This is such a distinct area of a home that building codes require different regulations than most other structures. We all have excess stuff in our garage that doesn’t belong in the house, like the half-full gasoline can that we use to fill our lawnmowers. We all take gas for granted but fail to realize that not only is gasoline explosive but the fumes from gasoline are explosive also. In a former career, I saw the results of this firsthand when an entire garage was gutted (with two cars and two motorcycles inside) when a homeowner was using gasoline to clean automotive parts and decided he needed a cigarette. Even though he was on the other side of the garage near an open door, it still ignited. We never know what we will run into. Simply put, we need to be aware of our situation and act accordingly. I cannot emphasize strongly enough that we are in unfamiliar territory when we are inspecting: we must be willing to explore but must do so with the utmost care and safety. Safety is in the back of our minds but rarely at the top of our “to do” list. So I challenge you to make a goal to re-evaluate your mindset and thoughts at least once a month. Think about what has happened in the last month and make adjustments for any errors you may have made. Make a pact with yourself to never make that mistake again. Do your own research into any incident you hear about within the home inspection industry no matter how minor. Inspect and repair all your tools at least once a month. Finally let me make a small list to be aware of for safety’s sake. This is far from comprehensive but still is important. Inspect all equipment regularly and replace anything that is defective. Make sure you have the proper tools to do your job right. Make sure someone knows where you are and for how long. Never enter any situation that you consider dangerous. Never allow anyone to coerce you to do something you are uncomfortable with. In addition to all this, remember that this is your livelihood. Never do anything or go anywhere that will compromise your ability to provide for you and your family. If you follow that simple rule, you will have a long, prosperous and safe career in the home inspection industry. Pete Hawley is author of the online course Home Inspection Safety, offered by Mckissock Education ($45/3 hrs. ASHI, NAHI, NACHI approved and by 15 states). The course is available at administrative costs to OREP.org insureds ($5.74- varies by state). Author and inspector Peter Hawley is a graduate of the Professional Association of Building Inspectors (PABI) Training Institute with over 145 credited hours of residential inspection procedures and technical training. He is a Licensed General Inspector in Nevada and has 20 years’ experience in residential maintenance, remodel and repair, 18 years’ experience as a residential contractor and 15 years of hydraulic leak detection. Hawley is a member of the National Association of Home Inspectors (NAHI) with a Certified Real Estate Inspector designation (CRI). He is a registered State of Nevada Radon Inspector with certificates from the National Radon Proficiency Program (NRPP) and National Environmental Health Association (NEHA). He is also a Certified Heat Exchanger Expert as qualified from Heat Exchanger Experts Inc.